The Rosabella double row Diamond hoop earrings combine Diamond sparkle with captivating movement—perfect for any occasion. Crafted from luxurious 18ct White Gold, each pair of earrings boasts half a carat of dazzling Round Brilliant cut Diamonds. Scattered across two pear-shaped hoops, a single Diamond rests within the inner section above five additional Diamonds held within the outer hoop. The Diamonds within the earrings have been graded H Colour SI1 Clarity prior to setting. 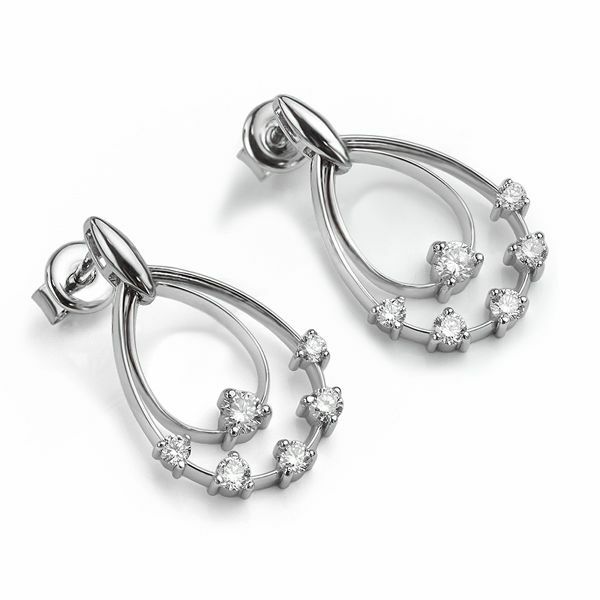 Typically, this earring design is available from stock for immediate delivery, or directly from our showroom. We include a beautiful Serendipity presentation box and free insured delivery to several countries Worldwide from our UK showroom. Please contact us for more help and guidance on this design or on any other styles across our range. Each earring measures 2cm in length x 1.3cm in width. Supplied with additional Lox earring backs for added security in addition to the 18ct White Gold butterfuly attachments. Create the perfect earring and pendant set by adding the Rosabella diamond hoop pendant. This perfect match compliments the Rosabella earrings with a 0.45cts diamond pendant with three hoops, set with brilliant cut diamonds. Crafted in the same luxurious 18ct White Gold, the pendant arrives beautifully packaged in its own presentation box with a simple curb chain ready to wear.